Adding bicycle lanes on both sides of Unser by widening the roadway from the inside median. Improving pedestrian access by adding in missing sidewalk, access ramps and pedestrian refuge areas in the medians and meeting all ADA requirements. Completing the Multi-purpose trail between Vulcan Rd. and Santo Domingo St. Improving traffic signal timing to increase level of Service through the intersections of Montano/Unser and Dellyne/Unser. Improving intersection surface to concrete at Dellyne/Unser and also at Montano/Unser. Resurfacing and Striping along Unser. Constructing a retaining wall adjacent to a small portion of the multi-purpose trail. Councilor Sanchez is working with the community, City of Albuquerque Traffic Engineers and Parametrix to address the speeding problem on Atrisco Dr. NW. Speed studies on Atrisco have found that more than half of the cars are traveling 48 miles per hour with a posted limit of 30 miles per hour. Councilor Sanchez' office has received a number of calls concerned about the safety of pedestrians crossing the roadway and resident's homes fronting Atrisco Dr.
A proposal to have the road reduced to one lane each way was presented to the community on November 13, 2014. Many residents attended the meeting and shared their thoughts regarding this proposal. In looking for a way to address the concerns of speeding a number of suggestions were made. Councilor Sanchez has asked the traffic engineers to look into all possible options. Comments that were received during the comment period are currently under review by our consultant and city traffic engineers. 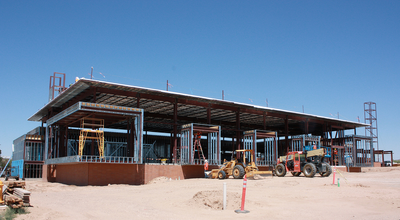 December 2014: The Central & Unser Library is on schedule to open in early spring of 2015! This is great news thanks to the dedication of the construction staff, the architects, and the City staff working on this incredible new library building. Construction work is in the final phase and should be complete in a few weeks. The ‘punch list’ needs to be complete in this 25,000 square foot building before installation of furniture and shelving can begin. The City of Albuquerque will continue to work on hiring and training the 13 new staff that will be required to open this building. See the exciting progress. This will be a state of the art, full service library with plenty of community meeting spaces, study rooms, and computer access, as well as being a comfortable place to browse our collection of books, magazines, music, movies and more. Rohde May Keller McNamara Architecture prepared the state of the art design which is now being constructed by HB Construction. Mayor Richard J. Berry, Council President Sanchez and the Albuquerque City Council, the Bernalillo County Commission, the City’s Westside legislators, and the entire Westside community have joined efforts to make this project a reality. Stay tuned for information regarding the ribbon cutting in Spring of 2015. Councilor Sanchez, Mayor Berry, the community, other elected officials and the children of Helen Cordero School’s Afterschool program held a ground breaking for the project in December of 2013. The northwest corner of Central and Unser was determined to be the best site for the next Albuquerque/Bernalillo County Public Library. Councilor Ken Sanchez sponsored a Community Charrette to discuss development possibilities at the City-owned NW corner of Central and Unser. Residents asked for an educational/institutional facility. The City Council was presented with the 2007 Albuquerque/Bernalillo County Facilities Plan which identified the Southwest Mesa as the most under-served area in the City for libraries. City Councilor Ken Sanchez was honored to be part of the unveiling of “Los Volcanes Senior Center Wall of Honored Veterans” on April 30, 2015. Councilor Ken Sanchez; Jorja Armijo Brasher, Director of Senior Affairs; Anthony Romero, Deputy Director of Senior Affairs; Maria Aguero, Center Manager; and Antoinette Sigala, Program Coordinator; Roger Newall of the City’s Veteran’s Affairs Department; and many others recognized over 30 men and women who served in United States Armed Forces and participate in the Los Volcanes Senior Center. These members are very involved at Los Volcanoes, participating in a variety of activities, enjoying meals with others, participating in dances and utilizing the fitness center. However it doesn't stop there, many of them volunteer at the center and continue to give back. One of honored Veterans and members of Los Volcanoes Senior Center is 96 years old Prospero S. Montoya, born in Monticello, NM. He was drafted December 1, 1941, days later war broke out with Japan. He served in the infantry in WWII. City Councilor Ken Sanchez was joined by Mayor Richard J. Berry; Jorja Armijo Brasher; Director of Senior Affairs; Anthony Romero, Deputy Director of Senior Affairs; Mrs. Mary Lou Vau Armijo and members of Mr. Joe Armijo’s family on November 26, 2013 to recognize the late Mr. Joe O. Armijo for his work on behalf of the senior community in our city. Mr. Armijo dedicated his time to the lives and well-being of the Senior Citizens of Albuquerque. He served the community through his appointment as a member of the Department of Senior Affairs Advisory Council for close to 10 years, he spent a number of those years serving as Advisory Council President. Mr. Armijo and his wife, Mary Lou Vau Armijo, shared their time with other seniors during breakfast almost every morning at the Los Volcanes Senior Center. In addition to Mr. Armijo’s work with the City of Albuquerque Department of Senior Affairs, he served the USA in World War II and was a member of the Knights of Columbus, the New Mexico Court Association, and the New Mexico Officials Association. Mr. Armijo was also a devoted father to his 11 children and a devoted grandfather to numerous grandchildren and great grandchildren. The city lost a great man when Mr. Armijo passed away in April of 2009. Councilor Ken Sanchez worked to have the fitness center named after Mr. Armijo, as he stated “It is an honor to commemorate Mr. Armijo’s dedication to the senior community in Albuquerque by naming the Los Volcanes Sports & Fitness Center after him. As a member and the Chairman of the Senior Affairs Council, he was instrumental in the development of this Fitness Center. This is only a small token of our appreciation for all of Mr. Armijo’s dedication”.